Skincare treatments for acne shouldn't interfere with the moisture balance of your skin - in fact, they work better when they don't! Many products on the market that are designed to combat breakouts contain harsh ingredients which cause peeling and dryness - which only encourages the skin to produce MORE oil. Mattify's skincare line gently dissolves oil and blackheads inside of pores, to target acne bacteria and heal breakouts, without leading to dehydration. The pathway to a healthy, acne-free complexion begins with exfoliation! Oily skin has sluggish circulation patterns & slow cell turnover rates. As a result, skin oils mix with dead flaky cells and bacteria, settling inside of pores. This mixture congeals inside of pores like glue, causing blackheads & breakouts. The Exfoliator is a finely ground facial scrub that contains 3 naturally invigorating ingredients to slough the away dead, dry cells that are clogging your pores: Green Tea, Apricot & Bamboo. The combined powers of these super-charged ingredients remove blackheads & pore clogging debris - allowing you to rediscover fresh, glowing skin. ​free radicals caused by sun exposure, while drawing out blemish-causing impurities & reducing inflammation. Caffine in Green Tea improves elasticity and reduces facial puffiness. Contains Vitamin C to boost skin elasticity & collagen production. Finely ground apricot kernels remove dead skin cells and blackheads. Smooths skin, stimulating circulation, skin clarity, and fresh cell growth. ​as residue from frequently used skin care products. Additionally aids in unclogging pores and creating a silky smooth skin texture. Scoop a small amount of The Exfoliator out of the container & rub in circular motions on damp skin. It can be spot-applied to flaky, acne prone areas, or applied to your entire face. After scrubbing for 15 – 30 seconds, rinse with water and use your regular facial cleanser to remove any residue. The Exfoliator can also be used to soften dry skin on the elbows, knees & feet. Everybody’s skin has different tolerances to exfoliants. If you have never used an exfoliating product before, test the product on a small area once every 2 or 3 days to start. As your skin gets accustomed to the removal of old cells, you can use the product daily. **Since The Exfoliator contains tiny granules, take care to avoid eyes. Rinse eyes thoroughly with water if contact occurs. Don't let blemishes force you into hiding! Those with oily skin often suffer from clogged pores and acne breakouts. When acne bacteria lodges deep inside of pores, it becomes buried in sebum (skin oil) and the pore becomes inflamed. Oxygen is blocked from entering the pore, and an infection begins to brew. The secret to destroying this deep seeded bacteria is the application of bacteria-busting ingredients, that can sink to the core of the breakout. Unlike heavy gels or creams, Stop-Zit is a liquid based treatment that thoroughly penetrates pores, to kill acne bacteria at the source. Stop-Zit prevents small breakouts from becoming larger, and allows existing blemishes heal faster - without the dreaded redness and peeling that many topical treatments can cause. A 100% natural and noncomedogenic acne treatment, Stop-Zit combines the strength of Alcohol-Free Witch Hazel with these 6 Essential Oils: Clove Bud, Lemon, Cinnamon, Eucalyptus, Rosemary and Clary Sage. After cleansing, rinse face with warm water and pat dry. Apply Stop-Zit directly to blemishes using the built-in roller applicator. Alternately, you can dab Stop-Zit onto a cotton pad, q-tip, or finger tip for application. 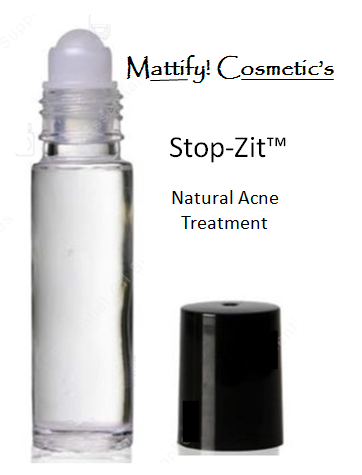 Stop-Zit can be used once daily, as a preventative treatment on areas of the face with large pores. For treatment & faster healing of an existing blemish, use 2-3 times daily on the affected area. A warming/tingling sensation will be felt for 30-60 seconds after application - this is completely normal. **As everyone is sensitive to different ingredients, we suggest that you test a small inconspicuous area to be sure no redness or irritation occurs within 24 hours of application** Do not apply near eyes. Should contact with eyes occur, flush thoroughly with water. in combination with Stop-Zit Roll On Treatment! ​"I just had to let you know how amazing this product is! I get the dreaded monthly acne breakouts and usually use Oxy pads and even the ones that are supposed to be for men’s skin, because they are stronger. My doctor had once prescribed Retin A for me, and then Benzol Peroxide, but they didn’t really do anything, so I gave up on professional treatments for this. Well a few months ago I bought the roll on Stop Zit from you. When my breakouts predictably started popping out, I applied it religiously in the morning, at my lunch break, and then at night after I washed my face. The next day, the breakouts were almost gone!! I really couldn’t believe it. Even with the super strong Oxy pads and Retin A, the breakouts would get larger and turn into big red bumps that would last for a week. Worst of all they would never form a ‘white head’ so I could pop them and have them go away for good. It was like the same zits kept coming back every month. So a few of the zits were almost gone by the next day, and two of them had white heads which I pierced to get the nasty stuff out. (Sorry I hope this isn’t TMI) haha. Then I reapplied more of the Stop Zit Treatment and the entire breakout was flat and almost gone the next day. Oh and another thing is, the Retin A and Oxy both made my skin super dry, especially around the breakouts. I would be peeling layers of skin off with a tweezer and it was really hard to hide all the blotchy patches under makeup. It was like my skin was almost cracking and it really hurt. Since I started with the Stop Zit there is no more peeling at all. It stings right when I use it on an open breakout but that goes away in a few seconds. And there are no bad after effects like with the other products I used. So happy with this! I will probably order the moisturizer next because even though I don't use moisturizer at all right now, it looks amazing!"